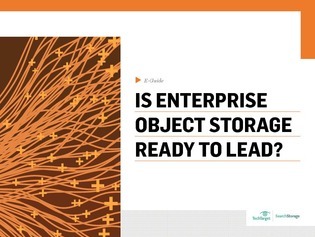 Is Enterprise Object Storage Ready to Lead? If your storage goes down, you need a way to recover it. And as data sets grow, this need to provide after-the-fact data protection can become incredibly difficult and expensive to address. So when more data is ingested than can be accommodated during backup windows, a more real-time approach is required to handling protection. This is where object storage technology comes in. This guide from the editorial team at SearchStorage.com serves as your go-to resource on object storage, with details on how object storage reduces the above complications and improves data protection and availability. Read on to view additional info on an object vs. file vs. block bake-off, the pros and cons object storage, a market overview, and more.